Every year Milly and her family visit Rome, stay with her mum's sister and her fiancé, visit the hotel where Milly's dad worked in his youth. This year Milly's aunt is getting married and its the first summer since her dad died unexpectedly. For the first time in their lives, Milly and her two sisters will be visiting Italy without their dad and, still grieving, they know that nothing will be quite the same. 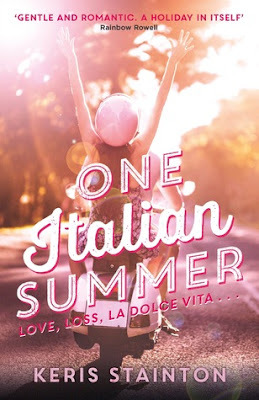 One Italian Summer was mostly a fun, quick read, that immediately made me wish I was in Rome eating ice cream and pushing through the crowds of tourists at the Trevi Fountain too. There was an undercurrent though, a constant theme throughout the story, of the overwhelming grief this family is feeling in this beautiful place that meant so much to Milly's dad. The fun parts of the book felt bubbly and alive, and the parts about their grief winded me and at times made me shed real tears. There are a lot of different threads going on in this novel and, honestly, at times it did start to feel a little much for such a short book. Milly has a lot going on and it did leave me feeling that there were certain aspects of her life I would have liked to have seen more of or that I could have done without. For example, Milly used to be in a band but since her father died she no longer talks to those friends. This was so briefly touched upon, however, that I often completely forgot about it until the next time it was mentioned. On the other hand I really enjoyed the way that the novel deals with Milly's growing sense of her own sexuality. Milly's interactions with Luke and their history felt very realistic, particularly because Stainton doesn't shy away from Milly's sexuality. That was refreshing to read. And, as I touched on above, I felt that Milly's grief was beautifully handled throughout the novel. All in all, One Italian Summer is something a little different and, although I had my small complaints, I would still absolutely recommend it for all its positive aspects, which definitely outweigh them. Group Collaboration | How Do You Choose Your Next Read? It's group post time again and this month we're talking ideas on how to select your next read. The responses we received share favourite ways to choose what to read next, along with those that haven't worked out quite so well. We would love to hear your thoughts and opinions on the suggestions below and of course your favourite way/s to choose your next read! Of all the responses we received to this month's prompt one of the most popular answers was that ARCs take priority when choosing what to read next. As many of our readers are fellow bloggers we completely understand choosing ARCs over any other reads in order to stick to a blogging schedules. "If I have an ARC that I've been sent, I'll read those first, in order of receiving them." "Review copies always come first, and then books I've been dying to read that I own." "I normally read according to my book blogging schedule actually! The free slots I have I just pick up books from my bought pile." Another popular response was that library loans were a priority due to the time constraints and those pesky late fines! "Next in line is always whichever library book is due next. Because late fines. Eek." "[After ARCs] it'll be any books I have out from the library (because we don't want to add to the already-growing late fines! ), and then books that have been sitting unread on my shelf for too long." It seems that a lot of bibliophiles find that the types of books they pick up change along with their mood or other factors like the time of year but if you have lots of unread books sitting on your shelf it can still be tricky to choose. 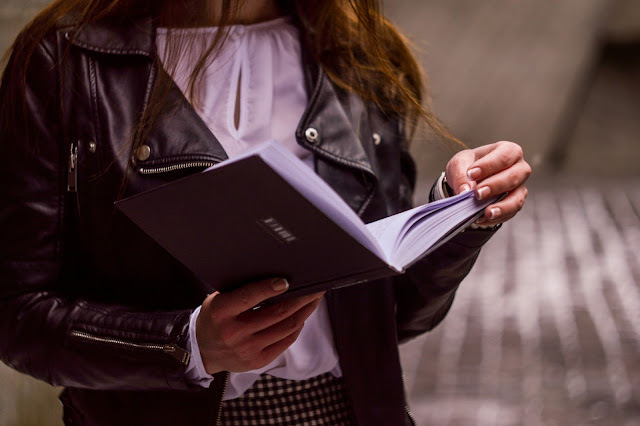 If you manage to narrow it down by mood but you're still stuck between a few different choices why not try out the first chapter of each and opt for the one that interests you most. 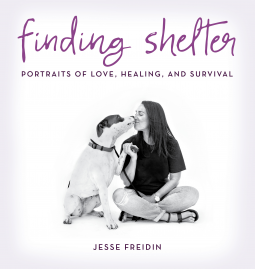 "I often find it's best to look at my bookshelves or scroll through my Kindle for inspiration and pick up whichever title appeals most at the time." Another popular idea is the 'TBR jar' where you write out the names of the books on your shelves, fold them up and put them in a pretty jar to be picked out at random when you can't decide what to read next. Unfortunately, whilst this sounds like a brilliant idea it does have it's flaws as a couple of our readers highlighted. If you're more of a mood reader a good tip to try is to colour coding the pieces of paper you add to the jar, selecting a different one for each genre or even length of book. "I tried doing a TBR jar a few years ago, as I loved the idea, but it never really worked because there was always a book I really wanted to read next." "I tried a TBR jar once. It didn't last long, because I was never in the mood to read what I pulled out." Another great way to choose your next read is to look for recommendations based on other books you've adored. Websites like Goodreads and Amazon have handy sections suggesting similar reads and bookstores usually have a recommended section but we really love What Should I Read Next? for finding new favourite books. "I often look at books which have been recommended by friends, or in book stores or online. 'If you liked ... you'll like ...' invariably I do like!" If you really can't make up your mind why not leave it to chance? We loved this suggestion of numbering the books and asking someone else to pick at random, or using a dice to decide! "If I can't figure out what kind of book I'm in the mood for, I give myself 5 or 6 options and then tell my husband to pick a number between 1 and 6. If he's not around, I roll a 6 sided die." Thanks to Rachel, Anjali, Lili and all of this month's anonymous contributors. If you'd like to get involved in our next group post drop and email to bloggersbookshelf@gmail.com or keep an eye out on our Twitter page (@blog_bookshelf) for updates! 1. Writing A Novel - we're kicking off this month's list with a link to BB writer Anastasia's new blog featuring following the process of penning her very own novel. Head on over to her blog to find out more! 2. Book Club Alert! - Belletrist is a brand new online book club created by actress Emma Roberts and producer friend Karah Preiss. Their first book club pick is Joan Didion's South & West and you can find out more about why Emma chose this title over on their website. 3. New Parent? - if you're struggling to balance your ever-growing TBR pile with life as a parent Heather has some great tips in this recent video. 4. Reads For 20-Somethings - Nylon shared a list of thirty-two books they believe every woman should read in their twenties. Do you agree with their choices, or would you add any different titles to the list? 6. Music & Books - we really enjoyed Maha's interesting thoughts on how books are just like songs! 7. In Need Of A Break? - this Buzzfeed article shares 18 Airbnbs that are perfect for book lovers! Which book-filled getaway is your favourite? 8. Read, Review, Repeat - over on her personal blog BB writer Anjali recently talked about reviewing books. Do you like to review everything you read? Let us know! 9. Series Love - in this post Anisha shares a list of popular series she wants to read. Which ones would make your list? Let us know in the comments! 10. Speaking Up - our final link of the roundup is from Hazel who shared her inspiring personal experience, discussing how YA title The Upside Of Unrequited helped her to stand up to body shamers. 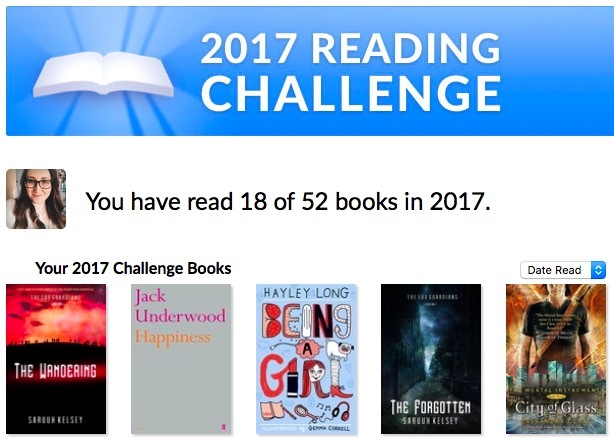 This year I'm taking part in the Goodreads reading challenge for the first time. For a few years now I've set myself an informal goal to read at least 52 books every year, but I never had any desire before to make it official in any way and I certainly didn't mind too much if I didn't achieve it. It's a pretty arbitrary goal anyway. What do I really achieve if I read a book a week? Well, currently I have over 80 books, in real piles on my bedroom floor and virtual piles in my Kindle and iBooks apps, that I haven't read yet. Somehow I just keep acquiring them faster than I can read them so I thought perhaps this year, in an effort to really drive myself to read them all, I would make it official. I would declare my intent to read at least 52 books online for all to see! It's working. I've already read 18 books. I'm 4 books ahead of schedule. But the thing is, it's mostly working because I've become more than a little bit obsessed with it. There was a little jolt of joy when the Goodreads sidebar first told me I was ahead of schedule. A little flash of pride when I saw I was 2 books ahead now. Then there was a quick stab of panic when I saw that the number had gone down from 4 to 3. There was a week where I checked almost every day to see when exactly the number goes down. Is it Saturday or Sunday when I go from being 3 ahead to only 2? When do I need to make sure I finish this book by to keep my lead? The last time I recall feeling obsessed with reading in this way was when, at about five years old, I decided I needed to be "better at reading" than one of the boys in my class. He didn't realise we were in a competition any more than the Goodreads challenge does. It's entirely possible that this competitive reading is unhealthy and I shouldn't be encouraging it in myself but I did have a reading age of 16+ at age 11 as a result of that one-sided competition so I can only conclude that this sort of thing works. I also like that I can see all the books I've read so far in neat little rows on my Goodreads challenge page. It's nice to have a quick overview of the sort of books I'm reading right now. Perhaps we'll say that that is the reason I've become obsessed and not just because it feels good to be ahead of the fairly arbitrary goal that I set myself and that no one else really cares about. Let's pretend it's because I like the organisation of it all instead. Are you taking part in the Goodreads reading challenge? Are you also oddly obsessed with it? Is this normal? Please tell me I'm not alone! Since my first Popsugar challenge update I've managed to cross four more challenge prompts off the list making a total of nine so far. If you're taking part in Popsugar's 2017 Reading Challenge let me know which prompts you've crossed off the list and which books you're planning to pick up next! This Contemporary YA title introduces Parker, a teen who lost her eyesight after being involved in a car accident. The novel explores what daily life is like for Parker and how she refuses to let her disability hold her back - the perfect fit for this challenge prompt! There were a few titles I considered for this prompt but in the end I settled on One Of Us Is Lying, an upcoming debut release. This YA novel is written from multiple POVs and follows the fallout of a detention gone wrong when one of the students doesn't make it out alive, leaving the other four accused of foul play. You can catch my full review of the book here on BB at the end of May! I recently picked up a secondhand copy of Mindy's first book from a charity shop which I decided for the purposes of this challenge counts as a 'used book sale'. The book was a really fun read and I'm looking forward to reading Mindy's second book Why Not Me? later in the year. When I saw this book pop up on Netgalley I thought it sounded like a lot of fun and thanks to the subtitle also a good fit for this prompt! 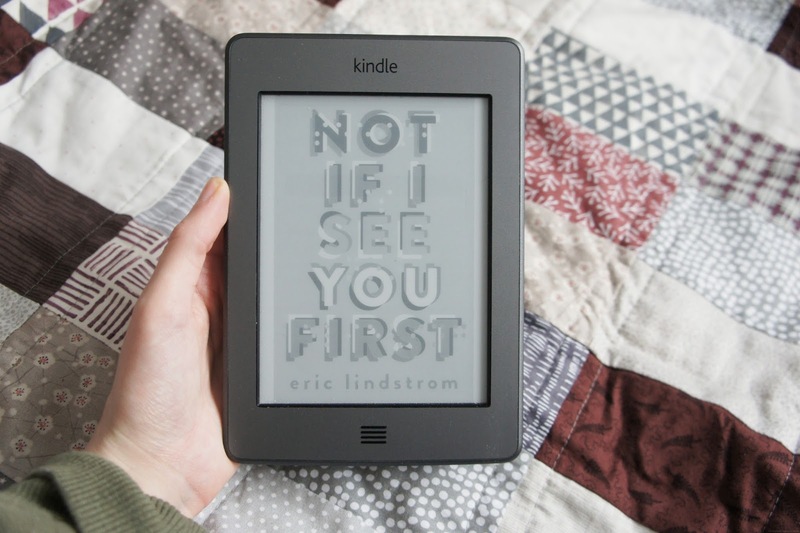 This non-fiction title follows the effect technology has had on the author's life, from Bette Midler message boards as a teen to working in the world of social media and trying out online dating. If you missed it, you can catch my review here! 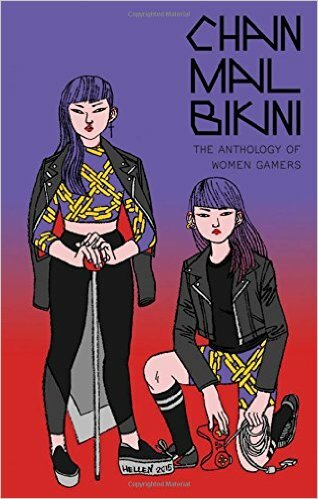 A collection of comics about women in gaming by women in gaming. The type of gaming includes: video games, LARP-ing, and tabletop gaming. I first learned about this book when I saw a kickstarter campaign for it. I couldn't afford to help it out, but I was very happy to see it get funded. When I found a copy of this book at my local comic book shop, I had to pick up a copy and I am so very happy I did. A lot of the stories in this collection are about the trials and tribulations a lot of women go through in the gaming community. One or two of them end there, but the rest show signs of hope and change in their communities. This includes fictional and non-fictional stories about women and LGTBQ gamers finding where they belong, in all the right ways. There is a place for everyone at the gaming table. Some of the stories were more about how gaming had affected the author individually. From one author who talked about living with severe OCD to another who talked about how defeating gaming monsters helped her stay strong against real ones. Other stories talked about how the authors find themselves and who they want to be in the characters they play as. This is an incredibly moving anthology that I think all gamers, or those interested in gaming, should read. I identified with more of the stories than I thought I would and I cannot recommend this book enough.